I have known David for some time now, having collected and admired his work for the past several years. He is a rare breed of artist – intellectually curious, incredibly humble, and wise beyond his years. His work is also something to behold, a body of work that tackles serious subject matter in what some would consider somewhat simplistic – paper collage. But his variation of collage is far from undeveloped – it is executed with a sense of purpose and depth that I have never seen before in the medium. 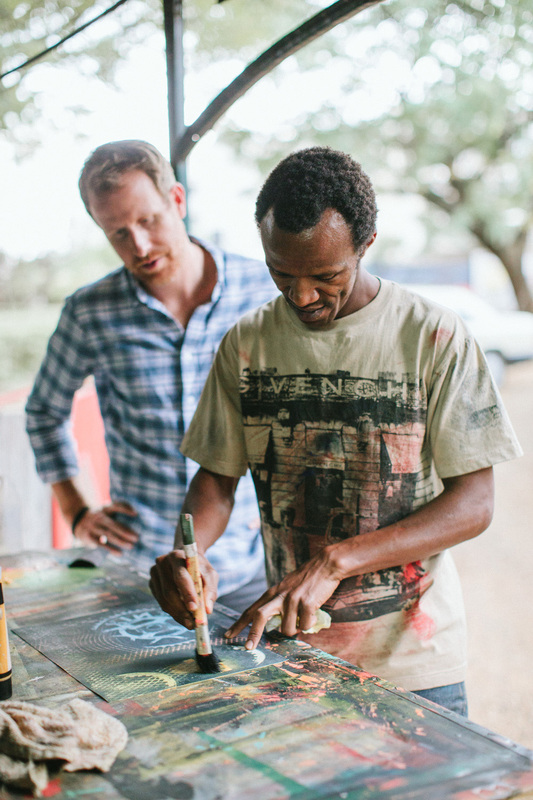 I spent an afternoon with David at his studio at Kuona Trust towards the end of last year and had the chance to chat with him about his process, his inspiration, and some of his guiding principles and practices. What are you currently working on? What is the name of the series, what’s the story behind it, and how did you get there? You have a very unique style of working with paper, could you explain how you discovered this style and why you like it so much? Actually, paper came about as a material of convenience. I had used it in less serious projects(handmade cards), but my studio practice rotated around oil and acrylics on canvas, though my love was most towards oils. It came a point where acquisition of my studio material became almost impossible coz of lack of funds, and since I had to remain relevant as an artist, I had to think deeper and rethought of my love of mix-media while I was in college. I started practicing several techniques on the available surface which was paper, and I happened to find out the interior lighter shade of some paper, which I ended up exploring more. I was doing this in private as I never knew how the response could be, but when I worked on social subjects and tried it in public, the intake was satisfying. I still study more paper properties...now with confidence. What excites you about each of these mediums? It’s easy to control...and am able to express myself freely through paper, as I follow my own set of rules as I work with paper and other media that work well when combined with it. Also, the process goes well with my narratives of choice, which are more of social structures which are represented at times by different layers of the material. Can you tell me what inspired your “Identity” series and its evolution? The identity series narrates my personal story of the need to belong, as I have been a victim of trying hard to prove my worth in different settings. I ended up being interested in studying "identity" as a phenomenon, and why simultaneous contrast affects the being of a person or object in different settings. What’s the last show you saw that inspired you? Constellations and Sediments II-The Void, by Peterson Kamwathi, at One Off Gallery. I respect his great personality and way of thinking. What’s the most indispensable item in your gallery? From the "Empty Seats II - Identity Series"
Yes I do...art exchange and/or purchase from fellow artists... Digital images from artists I revere, and also I buy books that add on my knowledge on art or any other subject that I feel interesting for my consumption. 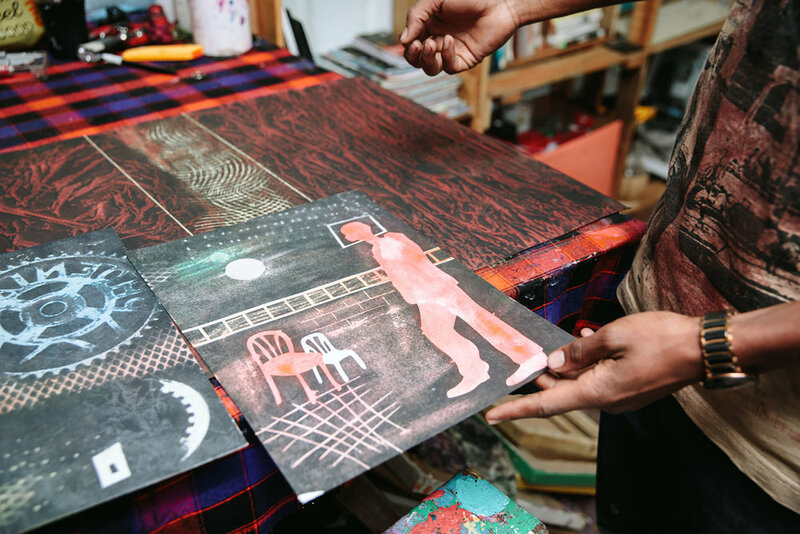 Would you label yourself an east African artist or a global artist? Global artist. I like my work to not only make sense to myself or my locality, but to have a global understanding. What international would you most like to visit (or what is your favorite museum you have visited)? I would visit Kerry James Marshall. Not visited any museum yet, but I'd visit The Louvre someday, as am interested in art historical development. Can you tell us about the next show you will be in? Well, am going to be in the AKAA (Also Known As Africa) in Paris this November...followed by a solo exhibition on an unclear date in Nairobi.